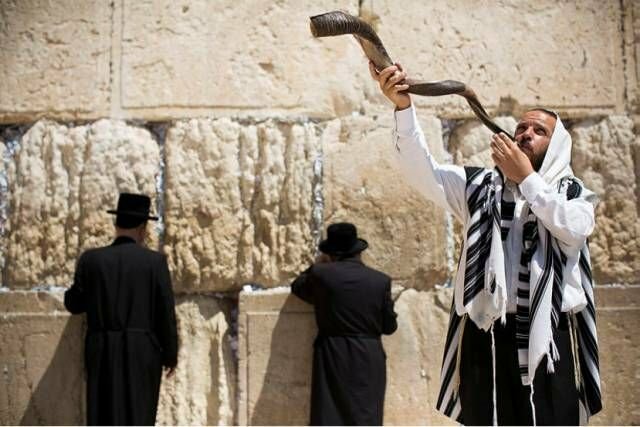 If you choose to go on a trip to Israel in this National Day, you will catch up the most important holiday — Rosh Hashanah. Although it is for veneration and confession, Jewish people consider it as a happy event rather than a misery. Because the pardon of God for evil can insure the coming happiness. Rosh Hashanah is counted according to Jewish calendar which is also called Tishrel. It is an ancient calendar and now used in Israel. The Jewish calendar is based on the phase of month. Although the Jewish calendar is based on the lunar cycle, so that the first day of each month originally began with the first sighting of a new moon. Tishrel also has intercalary month, making it possible for the length of one year as long as the solar period. The first new moon following the autumn equinox is the beginning of a new year. In addition, the intercalary month is the same as Chinese lunar calendar. There are 4 intercalary years in 11 years. However, the intercalary months are ranked behind the sixth months in intercalary years. According to the Holy Bible, the way of numbering the years begins with the first Sunday which created by God. Judaists believe that it starts in BC 3760. Furthermore, September 27, 2004 is the beginning of the Hebrew calendar 5765. Jews all over the world count the Judaism holidays based on the Hebrew calendar. Therefore, Jewish holidays are different from year to year. Rosh Hashanah in 2016 starts at the sunset on October 2nd and ends at the sunset on October 4. Sunset is the symbol of Jewish New Year rather than the sunrise. Rosh Hashanah signifies deeper meaning of ringing out the old year and ringing in the new year just as Chinese New Year. Rosh Hashanah is a two-day celebration, which begins on the first day of Tishrei. Tishrei is the first month of the Jewish civil year, but the seventh month of the ecclesiastical year. It is the new year for human being, animals and legal documents. It is for memorizing the god who created heaven and the world. And it also in memory of Abraham offered Isaac to the god. It settled in the 163th day after Passover. The tenth day after Rosh Hashanah is Yom Kippur. Rosh Hashanah reminds people of the popular story of Isaac. According to the Bible, god ordered Abraham to sacrifice his only son as a tribute. Abraham accepted the will of god, arranging a sacrificial altar to show his obedience and allegiance by sacrificing his son. At the very last moment, an angel brought the order of god that Abraham doesn’t need to kill Isaac, and show him a ram whose horn was twined by the side of boscage. The angel told Abraham that he can replace his son to the ram as a tribute—Abraham managed to pass over the test of god. God ultimately blessed Abraham. Devoted Jews will participate in long-timing synagogue, reciting specific prayers, and singing praise songs from generation to generation. The prayers and praise songs are different from different Jewish groups. The week before Rosh Hashanah (or a month, it depends on their background and custom), Jews will read certain “Confession prayer”, expressing the will of confession, begging for god’s forgiveness. The main symbol of Rosh Hashanah is ram’s horn, a hollow ram’s horn. There are varies of meaning about the festival of trumpets, at least three meaning are acknowledged. The sound of the shofar represents the supreme authority of god. Reminding Jews of the Ten commandments that Moses received at the foot of the mountain Sinai. It is for memorizing the loyalty that Abraham dedicated Isaac to the god. In this way, people confess a sin, wait for the judgment day and savior ‘s coming. Generally speaking, if the Rosh Hashanah is the same day of Sabbath, people will not blow shofar. The shofar is blown at various instances during the Rosh Hashanah prayers, and the total number of blasts over the day is 100. Apples means “truth”. This is the reason why apple is the symbol of life. Besides, eating apples with honey in Rosh Hashanah represents hoping for the happiness in next year. Therefore, delicious food is also essential for every family during the New Year. The ritual of tashlikh is performed on the afternoon of the first day of Rosh Hashanah by Ashkenazic and most Sephardic Jews. Prayers are recited near natural flowing water, and one's sins are symbolically cast into the water. Many also have the custom to throw bread or pebbles into the water, to symbolize the "casting off" of sins. In some communities, if the first day of Rosh Hashanah occurs on Shabbat, tashlikh is postponed until the second day. The traditional service for tashlikh is recited Book of Micah individually and includes the prayer "Who is like unto you, O God...And You will cast all their sins into the depths of the sea". 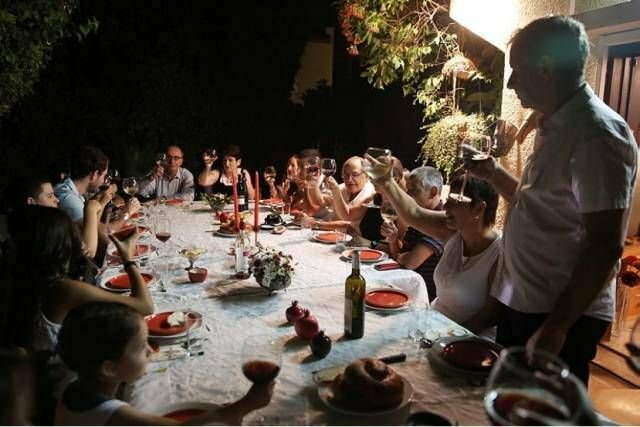 The night of Rosh Hashanah, even non-religious Jews will enjoy a holiday meal. Family usually get together on this day and drink wine joyfully, taste apples with honey and other dessert. The tradition also includes eating pomegranate, the fish heads, and other tasty dishes. It stands for fruitful result and bright happiness in the next year. People send New Year cards and gifts to each other, many of them also join gala parade to show their happiness. The Rosh Hashanah is a beginning for every Jewish people. After introspection, they will apologize to the people around to wash away all the faults they have made in the last year. Meanwhile, they can get a restart in the new year. So that Rosh Hashanah begins with repentance and atonement and ends with a wonderful dinner with family. The Jewish Rosh Hashanah has become an important spiritual for Jews to face future challenge.